Phoebe Sexton received so much mail on her 27th birthday, the postman couldn’t fit it in her mailbox. A 2006 graduate of Boston University, Sexton moved to Dallas just a few days before her birthday last year. But because she wasn’t with her friends to celebrate, she wanted the next best thing - for them to send gifts, cards, and letters through the Postal Service. We live in an age when e-mails, texts, and instant messages dominate communication - so much so that the US Postal Service is targeting 3,600 branches for possible closure over the next year because of dwindling revenue. The amount of first-class mail has declined every year since 2005 - last year it fell 6.6 percent, according to the service. “One of the main contributors to the decline was a 3.1 billion piece reduction in first-class . . . letters and cards that was driven in part by continuing electronic diversion of mail,’’ the Postal Service said in its 2010 Household Diary Study. Yet some young people steadfastly participate in the practice of sending letters via snail mail. While it may be quicker and easier to dash off an e-mail or text message, some folks who grew up in the digital age say they prefer the more tangible human connections and emotions that come from a handwritten note sent through the mail. Lindsey Warriner, 23, a self-described postcard fanatic who owns a small stationery company called Warren Tales, says she was devastated when she heard that the Postal Service is considering closing so many locations. “I feel like it’s very isolating, which is strange, because obviously they’re cutting the program because people don’t send mail - they send e-mail because it’s free,’’ said Warriner, who graduated in 2010 from Emerson College and lives in Brookline. Warriner says she loves sending postcards to her far-away friends, to let them know she’s genuinely thinking of them. She says she has inspired several of her friends to start sending mail in their circles. Samuel Pearce, 20, a Brown University student from Milton, began writing letters to an African pen pal as a child and to a friend at summer camp when he was a teenager, and when his best friend went away to college he chose to stay in touch via snail mail. This experience inspired him to write letters with other friends as well. It can be easy to forget or ignore the importance of the pen-written word, says Molly O’Shaughnessy, 38, of Jackson Hole, Wyo., who wrote a book called “Just Write,’’ which conveys the importance of handwritten letters in a society that is increasingly digitally obsessed. O’Shaughnessy says it is ironic that people consider sending letters or cards to be inconvenient, noting that it can take less than five minutes to write one. Dana Brinson, 34, a former resident of Jamaica Plain who lives in North Carolina, writes a blog called Save Snail Mail. 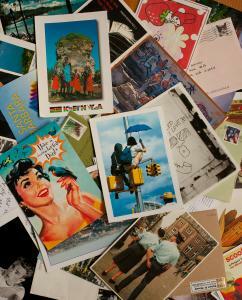 Her posts feature pictures of stationery, items about the pleasures of letter writing, postage stamps past and present, postal history, and postal-inspired imagery. “I’ve probably got a couple thousand readers a month. I just started the blog in January, and I haven’t promoted it in any way. People just seek it out,’’ she said. “It’s definitely resonating with folks. It surprised me; I’ve had people from the age of 22 to 62 e-mail me’’ to be pen pals. The snail-mail movement has also inspired technology developers to give the no-tech practice a modern twist. Smartphone users can buy applications such as Postcard Express, which lets users send an e-postcard to a friend’s e-mail address. Another app, Postagram, takes users’ photos from the Instragram app (which filters digital photos to make them look vintage) and turns them into real postcards sent through the mail, along with a 140-character typed message, for 99 cents. One drawback of the reliance on quick e-mails and text messages is that the art of long-form letter writing has dwindled. Tomasz Kolinko, 28, an iPhone developer in Warsaw, says he realized that there is a built-in human desire for the kind of connection that can be achieved by exchanging heartfelt love notes. But many people, he says, might not even know how to write them these days. He set out to fix the problem - using technology. Kolinko developed two smartphone apps meant to teach the technique of writing love letters. The app Tête à Tête helps writers compose personal, long-form love letters by providing inspiration for topics to write about. His other app, Sonnet, provides a service for quickly writing an emotional note, with some text content supplied. Both send out the finished product in an e-mail. Still, some would argue that even a heartfelt e-mail is a poor substitute for a handwritten letter sent through the mail. Correction: Because of a reporting error, an earlier version of this story misidentified the stationery company Warren Tales.